When mobile phones begin to show up in wall murals it is a good sign that they are deeply embedded into our way of life. It doesn't look like he is getting good news, Andy! yeap! this quy looks like my colleague. I know that many people fight it. And I know that there are times that they infringe and come between connectedness. But....they have changed the world for the better in so many ways that I refuse to be that person digging my heels in. I learn so much and at a moments notice whether it is news, history or pop culture related...it is at my fingertips. I feel safer being alone. I can travel easier. I can listen to great literature while walking the streets of Paris. They have their drawbacks but, all in all, I am a fan. That is true, Andy. The mural is terrific!!! Wow this is amazing wall mural Andy. This is the first mural I've seen with a mobile phone. Nice find, Andy. Made me think of this video, don't know if you've seen it. Mostly a good thing but sometimes not. I can appreciate the art, but it almost looks like the black outlines on the fingers and the cell phone were added later. His face looks like a photo! Our fellow here has the look of someone who might have taken one too many hits to the head and now is perpetually confused. He looks confused. I enjoyed this. I don't mind phones, and I'd hate to lose mine. The internet in general is proving to be a mixed blessing. Good so I can have blog and FB friends all over the world. Bad for the politics. Oh well, you can't put it all back into the box. Un grafiti muy expresivo. pero también puede significar la evidencia de nuestra dependencia de las tecnologías de la información y comunicación. It's like a sign of times now. Andy, I suspect they're starting to get embedded into our physiology, too. It's rare to see anyone under 30 without one planted in their palm. Even older folks like me are rarely separated from them. Wow, that really is a statement. I wish cellphones had never been invented, but I am becoming increasingly fuddy-duddy the older I get. 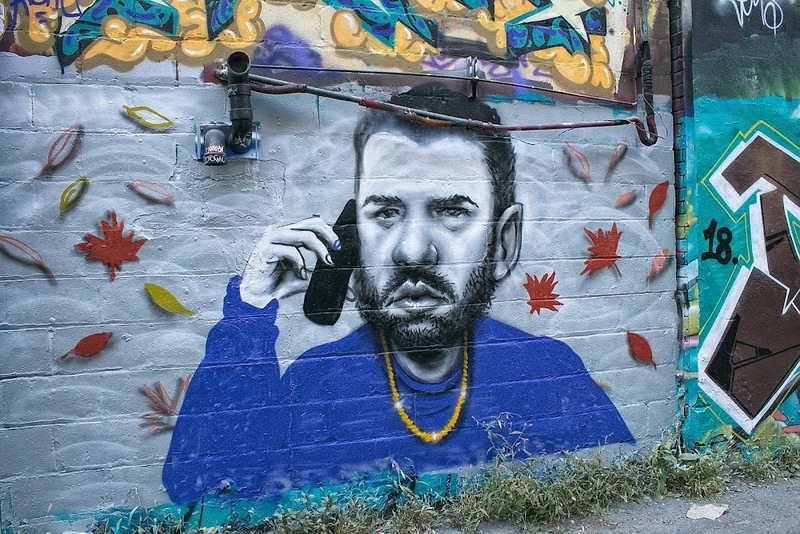 I like the mural and yes cellphones and technology are a way of life now. Yup! They're here to stay in one form or another Andy. I sometimes wonder how we did without them.. and yet we did! Thanks for you comments on my AM3 pictures. Your photography is superb and interesting.